No matter how carefully you plan, Murphy will find a way. The field of Amateur Radio is not immune to the irresistible force and perfect truth of this epigram. To the contrary, evidence of the absolute nature of these laws abounds in our hobby. Who among us has not heard of a $150 Svetlana GU-74B Power Tetrode sacrificing itself in order to protect the life of a 29 cent fuse? a) Any wire cut to length will be too short and at least one technician will try to rectify the situation by trimming off more wire. b) A dropped tool will always land in a linear amplifier where it will do the most damage. In the same way that parents are inextricably bound to Laura’s First Law of Parenthood, “A sick child will never vomit in the toilet,” so we radio amateurs find ourselves under the pervasive influence and effects of Murphy. I now offer you prima facie proof of this, by relating a true story concerning the effects of Murphy’s Law on Amateur Radio. I installed a 40 foot tower structure at my home in 2008. This installation was meticulously planned and executed. As part of my preproject research, I devoured every article, tip sheet, blog and tale of woe I could find on the subject of tower installation. Being that my shack is located in a wooded part of my property, I was especially concerned with calculating the proper clearances on all sides of the tower to allow for safe rotation of the beam antenna. The tower was carefully sited to avoid removing any of my desirable Red Oak trees. I calculated that I would need a minimum of twice the turning radius of my antenna (9 feet) to the nearest tree, in all directions from the center of the tower, at a height of 41 feet 6 inches. Higher up on the mast at 44 feet 9 inches would be a VHF/UHF Yagi antenna, but the clearance for this antenna was not of primary concern; at 6 feet in length it was a full 33 percent less than the turning radius of the larger and more expensive beam. I methodically measured and pruned until I was absolutely certain that the full 18 feet of clearance had been achieved in all directions, with a little extra cushion thrown in. On December 26, 2008 I triumphantly hoisted the beam antenna into its final resting place and I embarked upon a wonderful period of HF operating bliss. Fast forward to Monday, June 1, 2009. On this date the winds at my shack were sustained at 12 mi/h from the south with gusts up to 24 mi/h. This was the day Murphy arrived. Did a tree fall into the tower wrecking my beautiful beam antenna? No. Was a limb that should have been removed torn loose and sent hurtling into my precious beam antenna leaving destruction in its wake? No. Did a mini-cyclone pick up a full grown rhododendron bush from the nearby nursery and plop it neatly and precisely on top of my pride and joy? No. 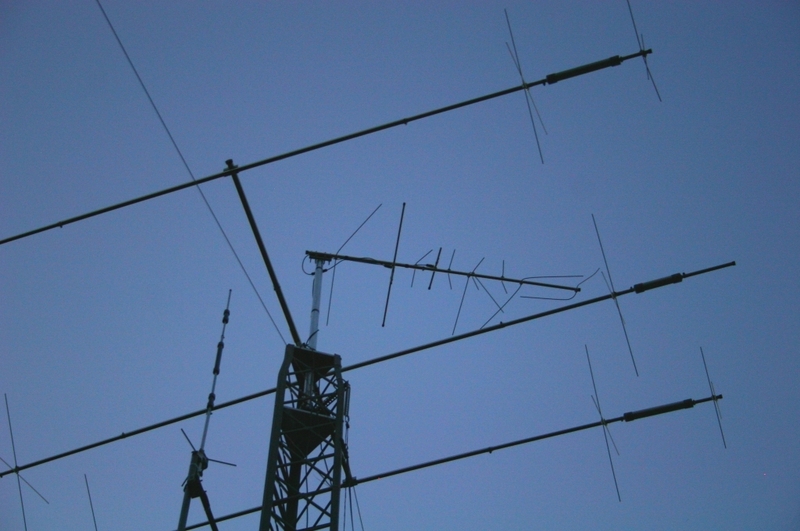 In actuality, nothing whatsoever happened to the beam antenna, but as the photographic evidence shows the VHF/UHF antenna was systematically and thoroughly ruined. Precisely 23 feet to the south of the tower base stood a 65 foot poplar tree. (Some call this a quaking aspen.) Given that this tree was listing approximately 7° in a direction away from the tower and was a comfortable distance from ground zero, I had deemed it to be of little concern. I have since learned that 24 mi/h winds do in fact possess the power to bend a 65 foot poplar tree over into a 90° angle, at a height of 40 feet, without breaking said tree. This miracle of nature is how the offending tree was able to repeatedly assault my VHF/UHF antenna from directly above, without any discernable damage to the tree. All quaking aspen within 100 feet of the tower have now been removed and I have learned my lesson. With Murphy as my witness I vow that in the future, whenever working with towers and antennas, I will always endeavor to look in every direction — including straight up. John D. Dean, KØJDD, an ARRL member, was first licensed in 2007. He resides in Woodbury, Minnesota with his spouse, Carol. He is still harboring numerous quaking aspen. He can be reached at 4118 Woodlane Dr, Woodbury, MN 55129.